Britain should be looking at enforcing a no-fly zone and a no-bombing zone in Syria, Conservative MP Andrew Mitchell has said. Speaking on ITV's Peston on Sunday, the former international development secretary insisted that while Britain and the US should not necessary be shooting down Russian jets, the government needs to "take a stand". "We have the ability and the power enforce a no-fly zone and a no-bombing zone - the issue is the political will," Mr Mitchell said. "I believe that the world decided that we would defend innocent people." He added: "We had a responsibility to protect hammered out at the United Nations, agreed by all the world powers, that we have a duty and responsibility to the 250,000 people today that are left, alive in Aleppo. We have to stand by what we promised." Andrew Mitchell MP speaking in the Commons. Syria President Bashar al-Assad should be at the "initial negotiations" into a peace settlement in the country, MPs have been told. Former International Development Secretary Andrew Mitchell told an emergency debate into the mounting humanitarian crisis in Aleppo that Assad is "not going to be beaten militarily in my view." The Tory MP also suggested the effects of the crisis in Syria on our children and our grandchildren "will be every bit as great as the effects on Brexit". The police officer at the centre of the so-called "Plebgate" incident has accepted £80,000 damages in settlement of his libel action against former Government chief whip Andrew Mitchell. Pc Toby Rowland was awarded the sum at the conclusion of his defamtion case against the Conservative MP at the High Court in London today. Last November, Mr Mitchell, who strongly denied using the word "pleb", lost a high-profile action against News Group Newspapers, publishers of the Sun. A judge had declared that he was "satisfied" Mitchell had used the "politically-toxic" word in September 2012 when he was not allowed to cycle through the main Downing Street vehicle gates. 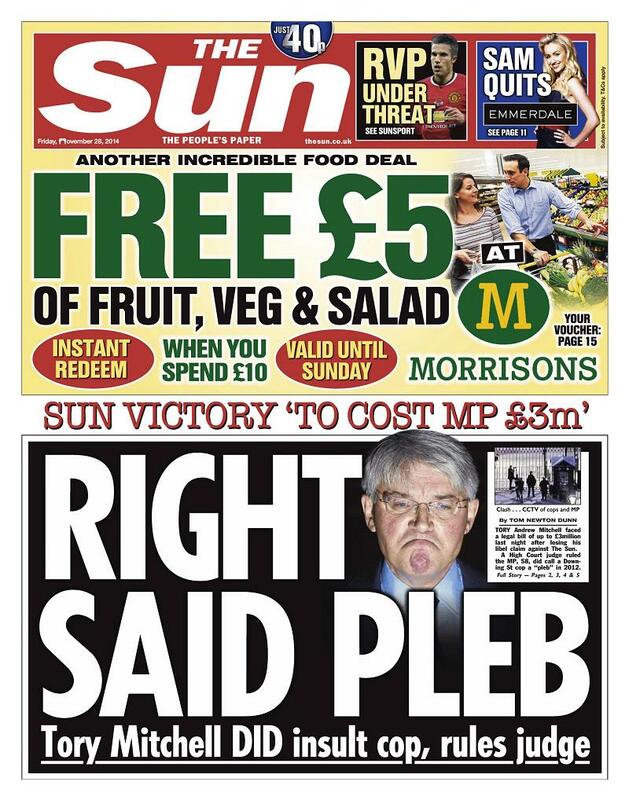 The Sun newspaper has hailed its victory over Conservative MP Andrew Mitchell in the 'Plebgate' libel case. It claimed the ex-Government chief whip's defeat would cost him £3 million in costs. The disagreement over a brief angry exchange between Andrew Mitchell and Downing Street police has ended two years later in a devastating High Court judgement for the former government chief whip. While Mr Mitchell has been ordered to pay initial costs of £300,000 after his libel action defeat, as ITV News Political Correspondent Carl Dinnen reports, it is estimated the 'Plebgate' case could end up costing him £3 million. The defeat of Andrew Mitchell's libel action against News Group Newspapers over the 'Plebgate' incident is a "vindication" for The Sun and its journalists, the newspaper's managing editor has said. We have always stood by our story and continue to do so. We are delighted that the judge has ruled that what we reported about events on Downing Street in the evening in question was the truth and accurate. There has been a lot of speculation and comment about Mr Mitchell's outburst, and criticism of our newspaper. The judgment today lays all that to rest. Our article broke this important public interest story, and it has been independently and conclusively confirmed. The Sun can be proud of its journalism today. Former Conservative MP Louise Mensch has strongly criticised a judge's decision to find against Andrew Mitchell in his libel action over The Sun's reporting of the 'Plebgate' incident, describing it as an "appalling miscarriage of justice". I say again that Andrew Mitchell should be given back his front bench post, stolen from him by police collusion; police jailed for it. A civil case is a civil case; no way do I believe Andrew at any time used the word "pleb" to police officers. A shocking result. The police officer at the centre of the Plebgate row has said the "pain" of going through the courts "has been indescribable" after a judge found in his favour over Andrew Mitchell. Speaking outside the High Court, PC Toby Rowland said he had "huge regret" that "what happened at the gates of Downing Street more than two years ago ended up here". He said he and his team had tried "everything possible" to avoid court action. "I am delighted that here again my innocence, integrity and reputation as a police officer has been recognised," he added. PC Rowland also called for a "line to be drawn" over the incident. The overall costs of Andrew Mitchell's failed 'Plebgate' libel battle have been put at £3 million, court sources have told the Press Association. Former Government chief whip Andrew Mitchell has said he is "bitterly disappointed" to have lost his High Court libel action over the "Plebgate" incident. 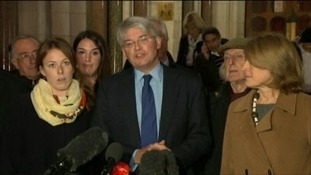 Andrew Mitchell was surrounded by his family and friends as he delivered his brief statement outside the High Court. Speaking outside the High Court, Mr Mitchell said the verdict came after a "miserable two years". The MP, who has been ordered to pay interim costs of £300,000, said he now wanted to "bring this matter to a close and and get on with our lives". After the ruling PC Toby Rowland said he hoped a "line can be drawn and everyone can be left in peace".